We have exceeded our initial fundraising goal of $1,700. MSA has raised over $1,800 to install a 25′ flagpole. 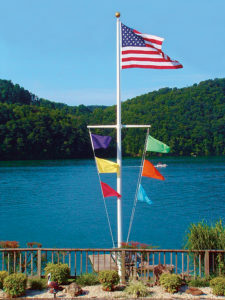 Due to the tremendous support for this project, we decided to raise the bar and install a 30′ nautical flagpole. This will require us to raise another $1,300, but our Main Street is worth the effort. We are raising funds to purchase and install a 25′ 30′ flagpole at the crest of Main Street(Approximately across from 24 Main Street). We need $3,120 to purchase and install the flagpole. We are looking for donations of $100 from donors. All donors will be acknowledged in the local newspapers. Please contact us if you are interested in contributing.